Malignant bone tumors are classified based on their predominant histological components. For example, chondrosarcoma is a tumor that consists of cartilage forming matrix. This may also translates to anticipated radiological features which will confer reasonably degree of diagnosis even prior to histology. The afore mentioned underlies our selection of some malignant bone tumors typified pictorially to buttress our reasoning. Malignant bone tumors could be primary or secondary. This taxonomy is based on the predominant component of the tumor. For example, chondrosarcomas refer to cartilage forming tumors. An 18-year-old male with painful swelling in the left knee for two weeks. There is cloud-like sclerosis of the proximal metaphysis of the left tibia with transphyseal spread. (Z shaped arrow) Note associated cortical disruption and aggressive periosteal reactions as evidenced by hair-on-end and Codman triangle periosteal reactions on the medial tibial cortex. This is accompanied by soft tissue swelling with mineralization and tumor new bone formation (see black arrow) (Osteosarcoma) (Figures 1a and 1b). 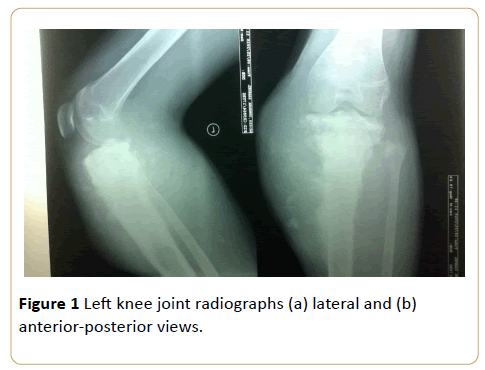 Figure 1: Left knee joint radiographs (a) lateral and (b) anterior-posterior views. A 9-year-old girl with bone pain and fever. This is consistent with disorders of haematopoietic system, and in this instance acute leukaemia. This appearance may be impossible to differentiate radiologically from metastatic neuroblastoma (Figure 2). 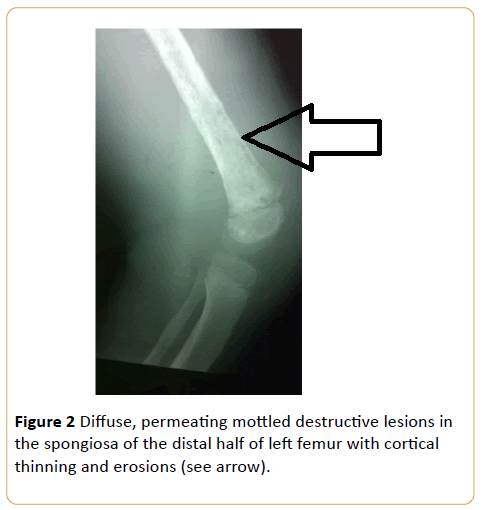 Figure 2: Diffuse, permeating mottled destructive lesions in the spongiosa of the distal half of left femur with cortical thinning and erosions (see arrow). Male patients with age range of 65-87 years with lower urinary tract symptoms, low back pain and confirmed histological reports of carcinoma of prostrate. Note the preserved disc space between L4/L5. (Osteoblastic metastasis to the pelvis from carcinoma of the prostrate). Note that despite the degenerative changes, disc spaces are relatively spared. (Osteoblastic metastasis to the lumbo-sacral spine from carcinoma of the prostrate). Note involvement of lower ribs bilaterally, iliac blades and proximal femora (see curved arrows). (Osteoblastic metastasis to the lumbo-sacral spine and pelvis from carcinoma of the prostrate) (Figure 3 - 6). Figure 3: Anterior posterior radiograph of the pelvis showing patchy osteosclerosis of L4/L5, whole pelvis and proximal femora (see arrows). 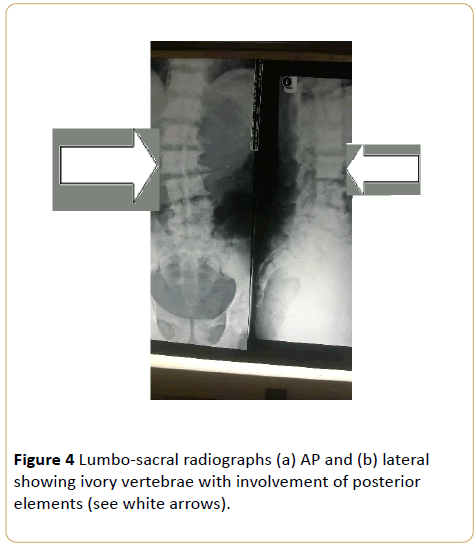 Figure 4: Lumbo-sacral radiographs (a) AP and (b) lateral showing ivory vertebrae with involvement of posterior elements (see white arrows). 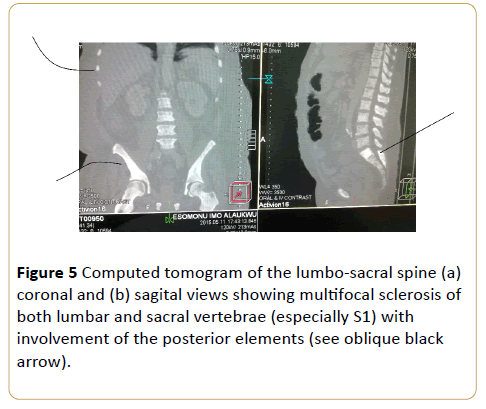 Figure 5: Computed tomogram of the lumbo-sacral spine (a) coronal and (b) sagital views showing multifocal sclerosis of both lumbar and sacral vertebrae (especially S1) with involvement of the posterior elements (see oblique black arrow). Figure 6: (a) T1W coronal and (b) T2W sagital MR images showing partial destruction of L4, L5 with altered signal intensities of these vertebral bodies. Note ventral theca sheath epidural compressions of cauda equina. 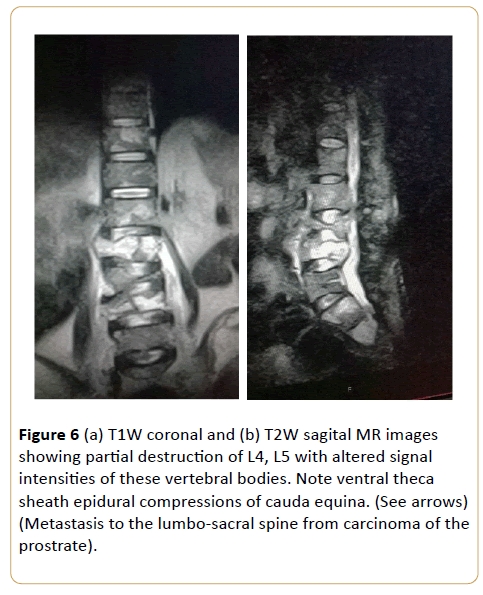 (See arrows) (Metastasis to the lumbo-sacral spine from carcinoma of the prostrate). A 51-year-old female with right shoulder ache for a month with swelling (Figure 7). 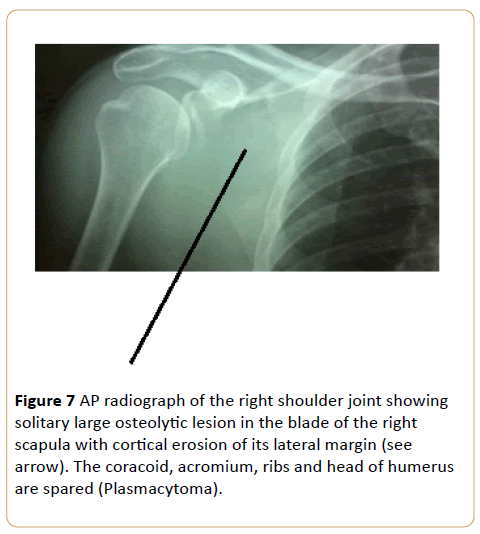 Figure 7: AP radiograph of the right shoulder joint showing solitary large osteolytic lesion in the blade of the right scapula with cortical erosion of its lateral margin (see arrow). The coracoid, acromium, ribs and head of humerus are spared (Plasmacytoma). A painless jaw swelling in a 45-year-old man (Figure 8). 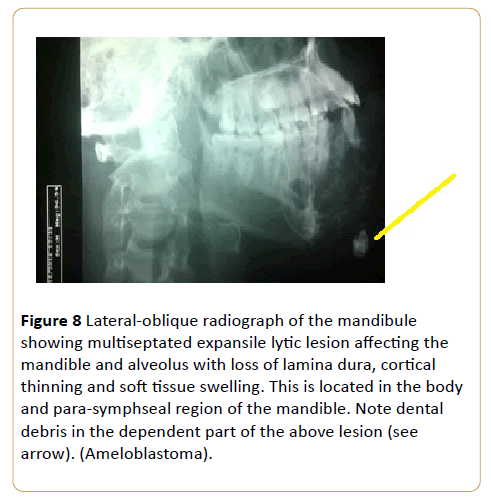 Figure 8: Lateral-oblique radiograph of the mandibule showing multiseptated expansile lytic lesion affecting the mandible and alveolus with loss of lamina dura, cortical thinning and soft tissue swelling. This is located in the body and para-symphseal region of the mandible. Note dental debris in the dependent part of the above lesion (see arrow). (Ameloblastoma). A 56-year-old man with thigh swelling and difficulty in walking (Figures 9a and 9b). Figure 9: (a) AP and (b) Lateral radiographs of the left knee joint showing–a huge expanding soap-bubble osteolytic lesion which has destroyed a large segment of the distal half of the left femur with extension into the soft tissues through many sites of cortical rupture (see arrows). This lesion demonstrates marked cortical expansion and destruction with a wide zone of transition. (Metastasis from renal cell carcinoma). We believed it is not irrelevant recapping few things about our selected malignant bone tumors. Osteosarcoma is a malignant tumor of connective tissue that predominantly produces osteoid matrix and different amounts of cartilage and fibrous tissues [1-3]. It is the commonest primary malignant bone tumor in young adults and children with incidence of 4-5:10,00,000 per year [1,4,5]. It occurs as the second commonest primary malignant bone tumor (20%) after multiple myeloma. Age incidence is 10-20 years of life with 75% occurring before the age of 20 with male to female ratio of 2:1 . The site of predilection of osteosarcoma is usually in the metaphyses of long bones. The posterior aspect of distal femur is the most frequent site . Osteosarcoma could be primary or secondary, each with different epidemiology and distribution. Acute leukemia is the most common malignancy in childhood, which mainly involves children less than 15 years of life . It forms about 41% of malignancies in children younger than 15 years . When a child is below 15 years, acute lymphocytic leukemia is the commonest subtype . The choice of this age is because of their growing skeleton with massive red bone marrow. Common radiographic features in leukemia are generalized osteopaenia, metaphyseal lucent band, lytic bone lesions, metaphyseal cortical bone erosions, collapsed vertebra, widened sutures, and periosteal reactions [7,8]. Plasmacytoma, is a neoplastic proliferation of plasma cells. It, is one form of plasma cell dyscrasia that may manifest as multiple myeloma, primary amyloidosis or monoclonal gammopathy of unknown significance [16-18]. Plasmacytoma may be osseous (medullary) or non-osseous (extramedullary) in terms of sites. It may also be primary or secondary to disseminated multiple myeloma. Renal cell carcinoma accounts for approximately 5% of epithelial cancers worldwide with female bias [19-21]. Almost one third of patients present with synchronous metastatic disease and another 20% experience recurrence or develop metastatic renal cell carcinoma even after nephrectomy [19,21,22]. Bone metastasis occurs in almost 35% of patients with advanced renal cell carcinoma [19,23,24]. Skeletal involvement is commonly an aggressive large lytic process. It demonstrates marked cortical expansion and destruction with a wide zone of transition. Its septated pattern suggest that it is an extremely vascular tumor. This causes substantial morbidity through skeletal related events defined as pathological fracture, surgical intervention, requirement for palliative radiotherapy to bone, spinal cord compression or hypocalcaemia . Almost 70% of renal cell carcinoma patients with bone metastasis experience at least one skeletal related events . Differential diagnoses of expansile osteolytic lesion are carcinoma from thyroid, lungs, breast or malignant melanoma. Some malignant bone tumors are known to have some salient diagnostic features on imaging which distinguish them from other bone tumors or at least narrow the list of differential diagnoses. 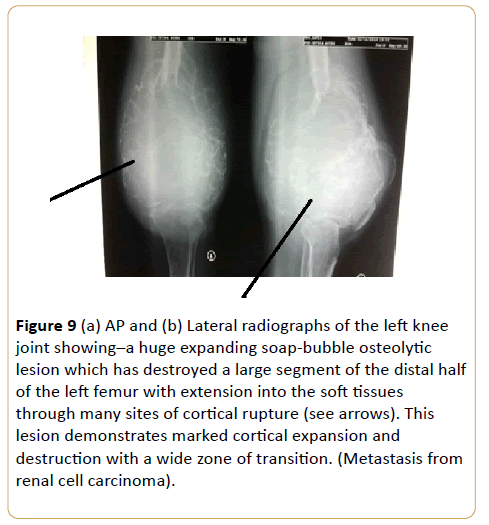 Yarmish G,Klein MJ, Landa J, Lefkowitz RA, Hwang S (2010) Imaging characteristics of primary osteosarcoma: Non-conventional subtypes.Radiographics30. Klein MJ, Siegal GP (2006) Osteosarcoma: Anatomic and histiologic variants. Am J ClinPathol125: 555-581. 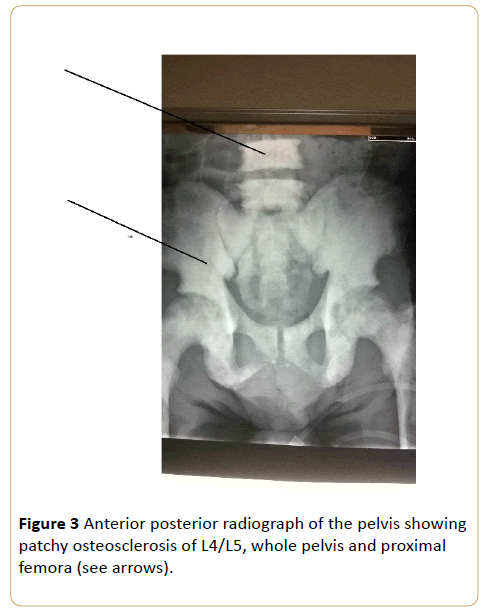 Liuhong W, MinmingS(2013)Well differentiated intraosseous osteosarcoma in the sacrum: A case report. Iranian Journal of Radiology10:175-178. Damron TA, Ward WG, stewart A (2007) Osteosarcoma, chondrosarcoma and Ewing’s saecoma: National Cancer Data Base report. ClinOrthopRelat Res459:40-47. Murphey MD, Robbin MR, McRae GA, Flemming DJ, Temple HT, et al. (1997) The many faces of osteosarcoma. Radiographics17: 1205-1231. Shahnazi M, Khatami A, ShamsianB, Hastooreh M (2012) Bony lesions in pediatric acute leukemia: Pictorial essay. Iranianjournal of Radiology9: 50-56. Slovis TL, Caffey MF,Faerbar EN, Coley BD, Adler BH, et al. (2004) Pediatric Diagnostic Imaging. 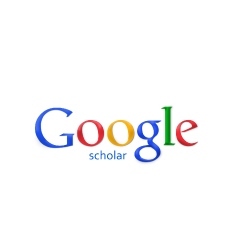 St Louis;Mosby Elsevier- Health Sciences divission. Barbosa CM, Nakamura C, Terreri MT, Lee ML, Petrilli AS,et al. (2002) Musculoskeletal manifestations as the onset of acute leukemias in childhood. J Pediatr (Rio J)78: 481-484. Messiou C, Cook G, DeSouze NM (2009) Imaging metastatic bone diseases from carcinoma of the prostrate. British journal of cancer 101: 1225-1232. Schnider A,Kalikin LM, Mattos AS, Kellier ET, Allen MJ, et al. (2005) Bone turnovermediatespreferential localization ofprostate cancer in the skeleton. Endocrinology 146: 1727. Cheville JC, Tindall D, Boelter C, Jenkins R, Lohse CM, et al. (2002) Metastatic prostrate carcinoma to boneCancer 95: 1026-1036. Tombal B, Lecouvert F (2012) Modern detection of prostrate cancer’s bone metastasis: Is the bone scan era over? Advances in Urology 8. FerlayJ, Shin HR, Bray F, Forman D, Mathers C, et al. (2010) Estimates of worldwide burden of cancer in 2008: GLOBOCAN 2008. International journal of cancer127: 2893-2917. Eustance S, Tello R, DeCarvallo V (1997) A component of whole body turboSTIRMR imaging and planar 99mTc methylene diphosphonatesctingraphy in the examination of patients with suspected skeletal metastases. American Journal of Roentgenology169: 1635-1661. Daldrup-Link HE, Franzius C, Link TM (2001) Whole body MR imaging for the detection of bone metastses to children and young adylts:Comparison with skeletal sctingraphy and FDG PET. American journal of Roentgenology177: 229-256. Dimopoulos MA, Moulopoulos LA, Maniatis A, Alexanian R (2000) Solitary plasmacytoma of bone and asymptomatic multiple myeloma. Blood96: 2037-2044. Kilciksiz S, Karakoyun-Celik O, Agaoglu FY, HaydarogluA(2012) Review for solitary plasmacytoma of bone and extramedullaryplasmacytoma. The Scientific world journal 6. Hu K, Yahalom J(2000) Radiotherapy in the management of plasma cell tumors. Oncology14:101-112. Pugiese F, Pagliuca V (2011) Metastasis of renal cell caecinoma. The New England Journal of Medicine 365-338. Doh L, Curtis AE, The BS (2005)Renal cell carcinoma. N Engl J Med354: 1095-1096. Santoni M, Conti A, Procopio CP, Ibrahim T, Barni S, et al. (2015) Bone metastases in patients with metastatic renal cell carcinoma: Are they always associated with poor prognosis?Journal of experimental & Clinical cancer research 34: 10. Murai M, Oya M (2004) Renal cell carcinoma: Etiology, incidence and epidemiology. Curr Open Urol14: 229-233. Athar U, Gentile TC (2008) Treatment options for metastatic renal cell carcinoma: A review. Can J Urol15: 3954-3966. Woodward E,Jagdev S,McParland L, Clark K, Gregory W, et al. (2011) Skeletal complications and survival in renal cancer patients with bone metastases. Bone48: 160-166. Santini D, Procopio G, Porta C, Ibrahim T, Barni S, et al. (2013) Naturalhistory of malignant bone diseasein renal cancer: Final results of an Italian bone metastasis survey. PLoS One 8:e83026.